After a first series of three scents launched in 2011, Autoportrait (Self-portrait), Still Life and Chambre Noire (Dark Room), Olfactive Studio’s fourth, Lumière Blanche (White Light), springs from a picture by Massimo Vitali, a world-renowned photographer whose work is featured in the collections of the Guggenheim and the Fondation Cartier. At a time when the issue of the artistic status of perfume is raised more insistently and acutely than ever, the involvement of such a major photographer emphasizes just how tricky the matter is. However much one believes in olfactory art, even such a recently recognized art as photography operates under very different conditions: perfume and gallery-exhibited works aren’t produced the same way, don’t circulate on the same markets, aren’t acknowledged by the same instances. Olfactive Studio attempts to partly bridge the gap by affording to perfumers as much creative freedom as artists enjoy: the developments are only lightly guided, if at all, by the brand owner Céline Verleure. 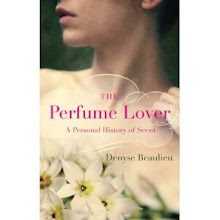 The perfume themselves aren’t meant to literally illustrate the photographs. Taken individually, they can stand alone, i.e. without the photograph. Taken as a collection, they reflect a definite aesthetic stance; a consistent taste which could be that of a curator or collector. Verleure may give freedom to perfumers, but she knows what she likes, and what she wants for her brand. With Lumière Blanche, the overlap/gap between perfume and its visual inspiration acts as a developer (in the chemical, photographic sense) of both the limits and fruitfulness of the exercise. 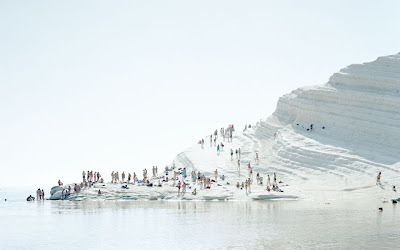 Massimo Vitali’s picture isn't just an arrestingly beautiful image: it is drawn from a series on beaches and, more generally, on leisure activities, which he’s been carrying out for over a decade. According to Vitali’s website, they are also the photojournalist’s comment on "the inner conditions and disturbances of normality: its cosmetic fakery, sexual innuendo, commodified leisure, deluded sense of affluence, and rigid conformism". In other words, the picture is an element of a body of work-in-progress as political as it is aesthetic. The primeval mound of chalk on which puny figures teem is a merciless comment on their vanity and insignificance: one extra notch in overexposure and they would be vaporized. It could be argued that a brand like Olfactive Studio is also an implicit critique of the “cosmetic fakery, sexual innuendo, commodified leisure, deluded sense of affluence, and rigid conformism” of the perfume industry. But the fragrance itself, Lumière Blanche, can’t convey as many layers of meaning as the picture it springs from, if only because it isn’t part of a series originated by an artist with a definite intention: like the overwhelming majority of fragrances, it is an answer to a brief. Sidonie Lancesseur’s response, her comment on Massimo Vitali’s picture, focuses on the picture as a discrete entity rather than as a part of a series. Its physical, sensory qualities. Its blinding whiteness. The incandescence of the sun at its zenith on a chalky cliff and quicksilver sea. Lancesseur conveys this contrast between searing heat and cool water by playing on hot and cold spices – the green-bitter-citrus bite of cardamom set against two almost tactile aromas, cinnamon and star anise. The sharp definition of the spicy top notes acts like the tiny strokes of colour – the ant-like figures on the beach – against the abstract, textured whiteness of the landscape. However, the heart of Lumière Blanche reveals a different interpretation of white. As in Blanc de Courrèges, the two notes used to translate it are iris and almond – the latter milky rather than candied, an effect intensified by the milkiness of sandalwood. Here, Lancesseur departs from the cruel grandeur of Vitali’s picture to create a tender haze that could be a contemporary rendition of l’eau d’ange. “Angel water”, a fragrance recipe created in the Renaissance, featured benzoin along with spices such as cinnamon, clove and nutmeg. 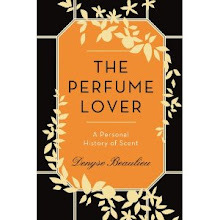 According to the perfume historian Annick Le Guérer, it might owe its name to the vanillic softness of benzoin, which had only recently been introduced in Europe. Lumière Blanche doesn’t smell like the eau d’ange re-created by Dominique Ropion for Le Guérer, but it does frame the same area of the olfactory map. And somehow, I can’t help thinking that even if it wasn’t deliberate, the idea of “white light” conjured angels and therefore their beneficial water, used for centuries to beautify skin and to ward off the plague… Which would lend Lumière Blanche as much depth of resonance as Vitali’s photograph, but on its own, perfume-related terms. A number of Vitali's prints seem actually rather drole and humorous to me, but many in his "Arcadian Remains" series have a sinister edge. Some, like these chalk cliffs and his pictures of Rosignano Beach, seem quite frightening to me. They give me the same feeling as David Maisel's aerial photos of Los Angeles. I will find a way to get a sample of the perfume- although I gather from your review that the scary edges have been smoothed down. It sounds wonderful, nevertheless. Marla, Lumière Blanche is definitely not scary or foreboding -- scariness is something to be usually avoided in perfumes, which is another of the reasons the field can't have the same scope as contemporary art. I love Olfactive Studio and to me there isn't a dud in the series. This is very off-topic but that stunning photo reminds me so much of the epilogue of Kaos by the Taviani brothers. It contains some amazing scenes shot on a pumice stone island. The fragrance sounds interesting and I discovered that the company does quite a nice deal on samples. Austenfan, I've never seen Kaos -- somehow it slipped through La Notte di San Lorenzo and Good Morning Babylon... As I said above, Olfactive Studio is well worth discovering. Erin, I think distribution for Olfactive Studio in North America should happen soon. As for comparing Lumière Blanche with Baume du Doge, I don't have a sample of the latter, but if memory serves, it's much fiercer than Lumière Blanche which is more of a soft luminous aura. I think it's a lovely idea for a line, being inspired by something visual like a photograph. I love how much room it leaves for the perfumer to interpret. It's certainly has to be more inspiring than, "Make us a perfume that every 23 year-old girl will want to wear for six months." And the juice sounds right up my alley - lately I've been a real sucker for benzoin. Amy, I'm sure this kind of work is a lifeline for perfumers, at least the ones who are still bent on expressing themselves more fully through their craft... Bear in mind though that Lumière Blanche doesn't contain benzoin -- the one fragrance in the Olfactive Studio collection that features it is Auto-portrait. Your review is smart and well written, but get to the point : Do you enjoy "lumière blanche"? and how. Somehow, knowing that "lumière blanche" is well crafted is not enough. Are you implying it left you cold? Julien, there's more than one way of enjoying perfume. One of them, for me, is what it enables me to write. What you're asking for is an entirely different blog post but for the record, no, it doesn't leave me cold and I do enjoy it. Cause it left me totally underwhelmed. Anise weakling. Lighter than an edc. So thin. It's hard to denounce as either bad or good something that smells so close to nothing. I swear one can't overspray this one. It gives a lot of place to the "emperor's new clothers" effect. 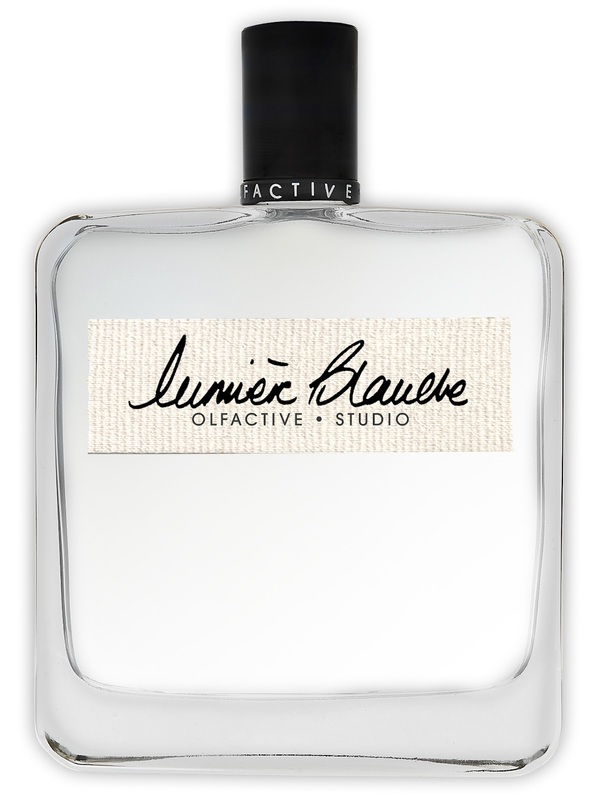 The olfactive studio people are maybe the nicest people, but somehow with lumière blanche I'm conforted in the prejudice "new niche brand sells vapid scent". "Méchant loup" (anisic) or "Géranium pour monsieur" totally ace this one. To give into the details, at the beginning under anise, I detect at a microscopic scale : some heliotropin (mimosa), an almond bitterness, and a pine-like cheap smell. And a spiruline seaweed undercurrent (like "cote d'amour" from l'artisan parfumeur). 30mn later you sometimes catch the tinier whiff of anisic spirit. On fabric, it leaves the faintest mulch scent, that I like. Julien, I'm sorry you spent your money on a scent you don't enjoy. I'm sure the bottle will find a good home. "You shall NOT blindbuy" is the first rule of the perfumelover. The second is "But vintage and obscure niche brand can be soôo rewarding. Take the risk". Julien, apart from vintage (way back when eBay perfumes were accessible from French IP addresses) I must have blind-bought two bottles in my life. One hit (Bulgari Black) and one miss (L'Air du désert marocain -- there's an amber note in most of Andy Tauer's perfumes that I can't wear)... Better to start with samples or decants, isn't it? I'm not much of a samples guy. I've never got my habit with sample selling site, or made enough networking. But I can teach you how to bypass ebay, so you can see and bid on Guerlain auction anew.